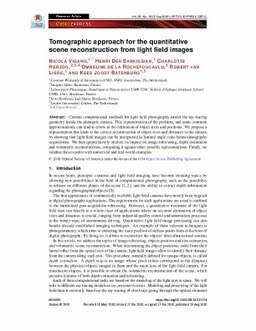 Current computational methods for light field photography model the ray-tracing geometry inside the plenoptic camera. This representation of the problem, and some common approximations, can lead to errors in the estimation of object sizes and positions. We propose a representation that leads to the correct reconstruction of object sizes and distances to the camera, by showing that light field images can be interpreted as limited angle cone-beam tomography acquisitions. We then quantitatively analyze its impact on image refocusing, depth estimation and volumetric reconstructions, comparing it against other possible representations. Finally, we validate these results with numerical and real-world examples.